Chandeliers, cheesecake, and charm bracelets make me happy, says my blog's sidebar. It's not just an alliteration thrown in mindlessly; it's a fact. 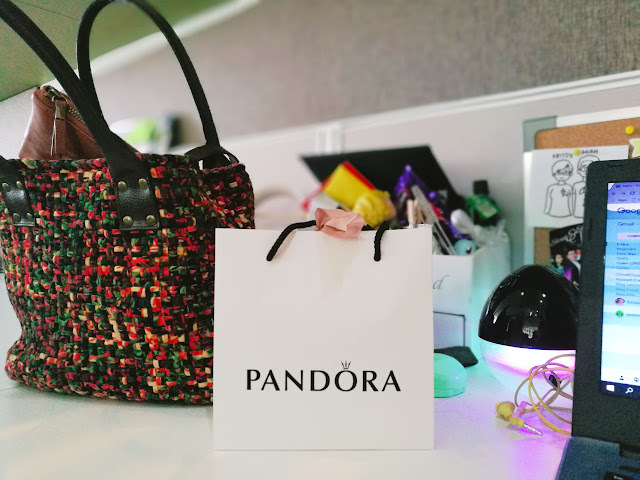 Today, I made myself extra happy by getting my very first PANDORA jewelry - a PANDORA Charm Bracelet in Sterling Silver. I only went to SM Aura with my officemate/ friend Hannah to eat lunch and possibly get milk tea, but I walked back to the office with a full tummy, a Stromboli to-go, and a paper bag from PANDORA. Blame Hannah for being an enabler. It's one of those rare expensive buys where I didn't feel instant guilt and remorse after, though. Probably because I've been wanting to start building a legit charm bracelet made of my milestones and it's only today that the stars aligned for me to do so. 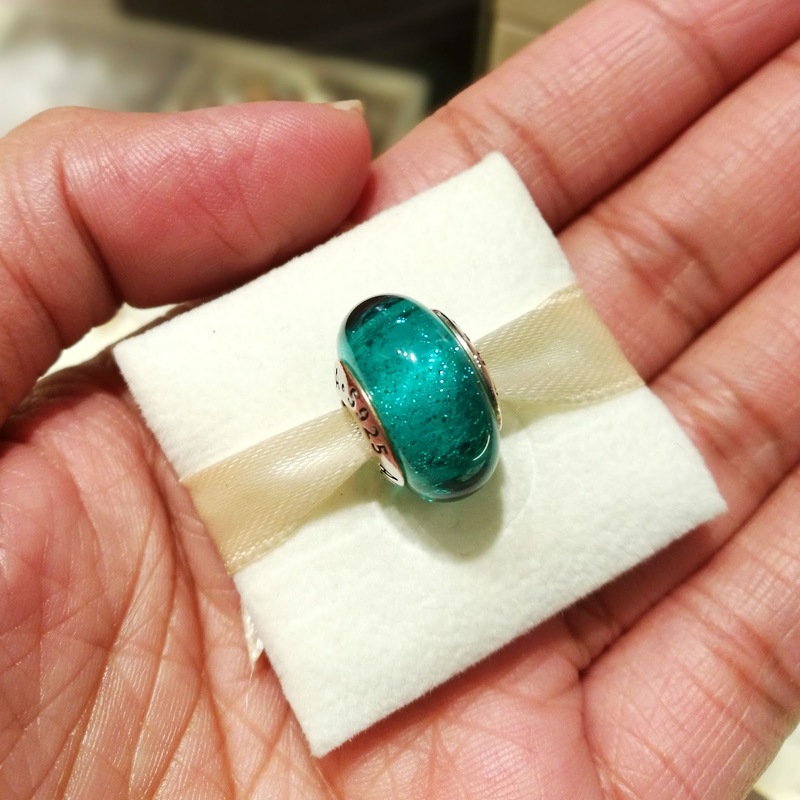 Still, I've only just come from two trips out of the country and I should be replenishing my savings, so what was I thinking walking into a jewelry store, psyching myself up that I was simply there to "just look around"? NO REGRETS. What, it's my birthday gift to myself, okay?? The truth is I'm a big sentimental cheese-ball. I'm a magpie pack-rat and I keep a lot of stuff for its sentimental value, not acknowledging the fact that I can barely sleep in my room anymore because of all the stuff lying around. I actually wanted to get a charm bracelet at the Universal Studios in Singapore. There was a really pretty Swarovski bracelet I wanted to get and there was even a promo wherein you could get a tennis bracelet for free for an initial purchase of just 50SGD! I stopped myself though because I've already purchased a lot of books and I still needed to mind my budget for the next coming days. I regretted not getting it, but I'm much happier with my PANDORA now! Credit should also be given to the lovely PANDORA Sales Assistants at Elemento in SM Aura earlier today. Hannah and I were wearing really casual clothes (the type that made us look out of place in a jewelry store, heh) yet not once did they patronize us but instead assisted us and patiently answered all our questions. I intend to get my first charm before the month ends. A letter K charm, maybe? My birthstone? A charm for my endless fascination with the night sky? Or maybe this Disney charm named Jasmine's Signature Colour, a sterling silver, sea green fluorescent Murano glass? It's limited edition (it's not even on the website anymore) and I'm worried they'll run out of stocks before I could get one. Yikes. Can I get one of everything, please? Now I'm slowly building my wish list and I'm SO EXCITED to earn more money and dress up my bracelet with charms that are relevant to me, my life, and all the big events that have happened and will happen to me.